Trophy Ridge 4 Pin Fiber Optic Sight- 4 pins that gather light very well. Allows for low light shooting and for left/right hand adjustment. Trophy Ridge Whisker Biscuit- Makes sure the arrow stays put even after dropping the bow or knocking the arrow. 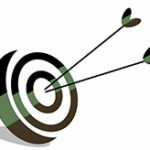 Once the shot is made the arrow can pass through the whisker biscuit without any damage to the arrow fletching. 6 shooter Arrow Quiver- This quiver can hold up to 6 aluminum or carbon arrows. It comes equipped with a camo hood and a cut away hood to ensure the process of adding or removing arrows is very simple. It can hold both mechanical and fixed broad heads. Release Loop- Comes with release knock loop. 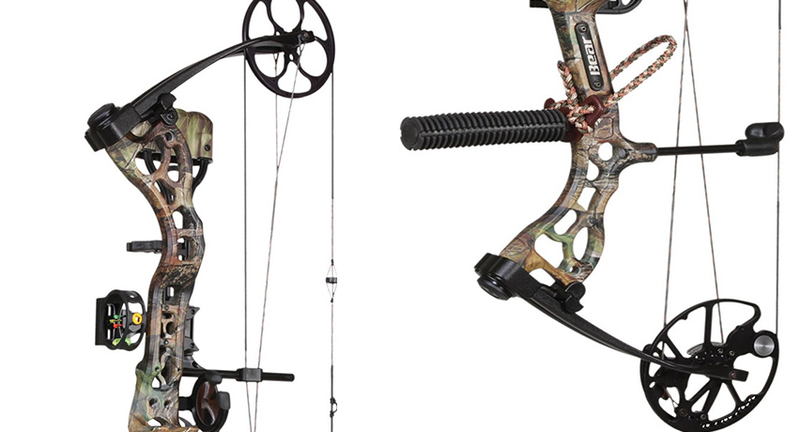 Trophy Ridge Stabilizer And Sling- Reduces almost all vibration of the bow when the shot is made. Peep Sight- 5mm diameter hole. Fits onto bow string. Trophy Ridge Sight Light- Improves low light shooting situations. The Effect is a two cam bow topping out at about 325 feet per second. It has a peak draw weight of 70 pounds and features a draw length of 27-31.5″. 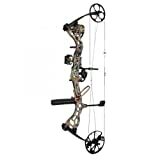 It weighs a very light 4.2 pounds which it makes it the perfect compound bow for hunting. It comes equipped with a 75% let off. One of my favorite things about the Bear Effect is that it performs substantially well in low light situations. This is very rare for a package bow as they usually skimp out on the quality of the accessories, more particularity the sights. Adjusting the draw length is as simple as it comes. It is made with a H13 Synchronized Hybrid cam system which allows tweaks with a simple module rotation. Built with an aluminum alloy riser, it makes the Bear Effect one of the toughest bows on the market. I have friends who have dropped this thing out of a treestand and it still shoots straight with little to no adjustment. Some may complain of the advanced grip system which makes it somewhat difficult to grip the bow. However the advanced grip system is there to help you. It forces you to place proper grip on the bow which will help you in the long run as you dive deeper into archery. After shooting the Effect for a week, I noticed that my grip had changed quite significantly when I shoot my other bow. Not only was using a more proper group, my shot also improved significantly.